Farmers Market Foodie | The home cook's guide to seasonal produce recipes. This isn’t a late Halloween post, although with a name like Bloody Butcher it would have been ideal with my annual Halloween Chili. Bloody Butcher is actually an heirloom variety of corn that you have likely seen more as an ornamental than an edible. It is, however, quite edible, in many ways, including as cornmeal. Don’t get excited, I am NOT grinding my own cornmeal. But, our awesome CSA Farmers do take the tedious time to grind it down and put it in our CSA boxes. It is similar in every way to yellow cornmeal but it sports a gorgeous purple hue. We were in Charleston last week. Great town with fabulous food. I ate my weight in handmade biscuits and cornbread. So it was natural upon returning that I had to bring a little Charleston home with me. I admit, you likely won’t find Bloody Butcher cornmeal at your grocer. But, if it or any other heirloom variety does cross your path, consider giving this recipe a try. Its heirloom status makes it extra special to make with the kiddos when talking about Thanksgiving Dinner old and new. I’d hate for my kids to grow up thinking the Pilgrims had boxes of Jiffy floating around in their pantry. This is the perfect recipe for this year’s table and those who are dining with us will certainly see some. I’ll be serving mine complete with Sarsaparilla Honey Whipped Butter, the honey of which we bought on a recent trip to Alaska. Ah, Alaska, that’s another post entirely… So many things to be thankful for this year- great trips, great friends, awesome family and even a new hound dog. Preheat the oven to 375. Melt the butter in the microwave. In a medium size bowl, whisk the butter and milk together. Add the egg and whisk until combined. 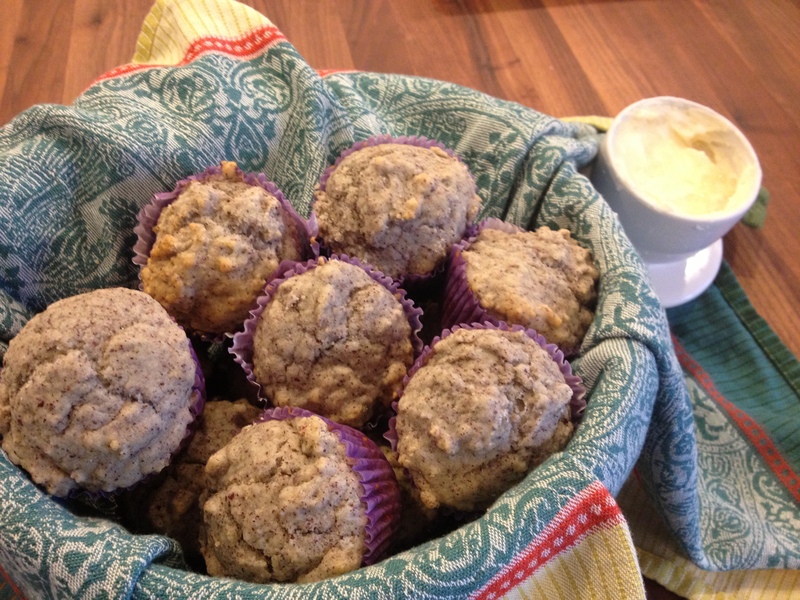 In a medium sized bowl, combine the cornmeal, baking soda, salt and flour. Slowly add them milk mixture and combine thoroughly. Pour into pans and bake accordingly. It’s been a ridiculously hectic month of May. With Hubs and I doing our fair share of over booking ourselves, there has been little time for new recipe creation… or cooking… or sleeping…well you get the idea. Times like these cause me to go into auto-pilot in an effort to just get through each day, I rely on past recipes rather than creating new ones. I’ve been declining some fun offers lately. One of my friends, unwilling to wait until June to hang out started showing up at my workplace to convince me otherwise, then a second showed. Then the text messages started rolling in, then lots of frowny emoticons on Evite. Fine, I get the memo. All work and no play makes for a sad group of friends. No need to bring anything to the potluck they assured me. I agreed and offered to bring wine. The day of the party I woke up with a nagging voice in my head. It was my mother’s. So lucky for me, I had a good 3 pounds of zucchini in this weeks CSA basket. I pieced the following recipe together in about an hour, including a quick trip to the store. When we arrived to the party, late as promised, everyone else had finished eating and was ready for dessert. I don’t know if it was the empty bottles of wine they’d consumed or the fact that I just haven’t been out in a while, but, I don’t think I have ever made a recipe that was so well-received. Even the kids wolfed it down, assuming of course that it was apple. Hands down, it was a huge hit. Before the last piece flew into people’s mouths we quickly took a photo- on a paper plate. It isn’t fancy, but sometimes the best things in life aren’t. This recipe gives me renewed faith in the ability to create something wonderful from even the most chaotic times. It also makes me look forward to a long summer ahead of zucchini, potlucks with friends, and the “occasional” chance to get off auto-pilot. Grease an 11×9 baking dish. Heat the oven to 375 degrees. Peel, seed and slice zucchini into half-moon shapes, so they resemble apples. In a large saucepan cook down zucchini, orange juice and salt for about 20 minutes. Drain excess liquid. Mix in 1/4 tsp nutmeg and 1 tsp cinnamon and stir to combine. Set aside. Cube the cold butter into small pieces and combine with 4 C. flour and 2 C. sugar. Combine until mixture resemble crumbs. Combine half of the crumb mixture with the zucchini mixture and press into the bottom of the baking dish. Top with remaining half of crumb mixture and sprinkle 1 tsp cinnamon on the top. Bake 35-40 minutes or until light brown and bubbly. 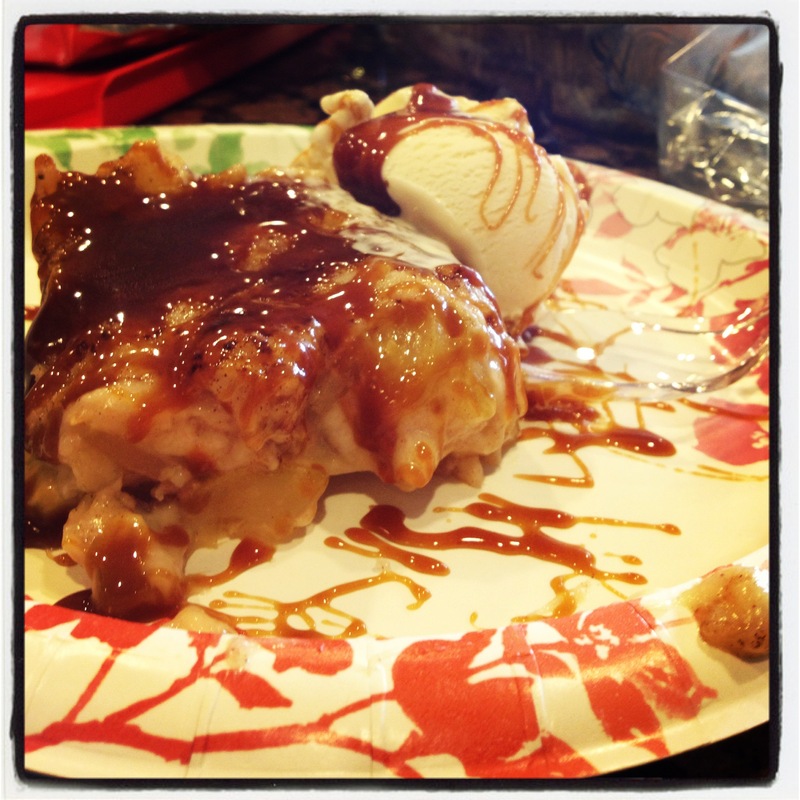 This dessert holds its own, but is extra decadent with the optional addition of ice cream and caramel sauce. 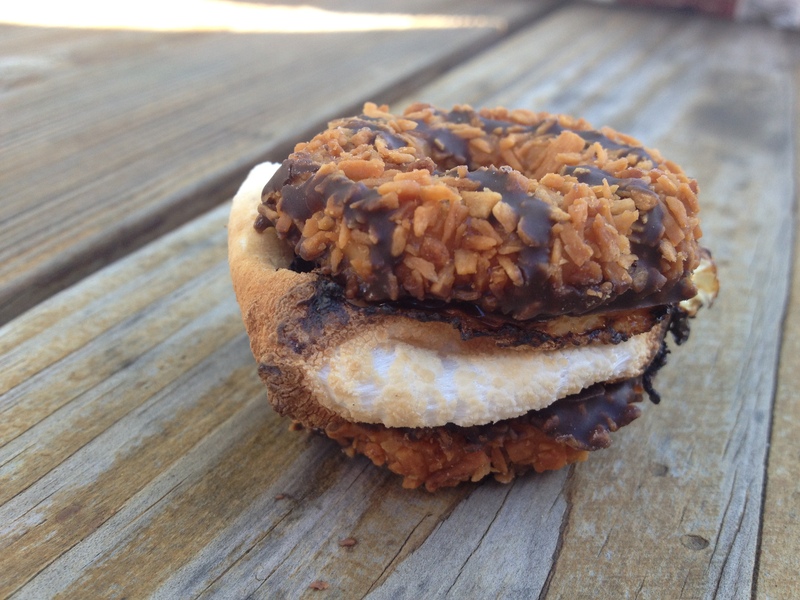 Here is a fun recipe I just did in collaboration with KOA’s The Greater Outdoors Blog. The recipe is in fact real, and with the exception of the cabbage, many of these events, did not occur. Anyone get the feeling food prices have gone up lately? Me too. Which is why I like to reach out to Mother Earth to see what goodies she can provide. Recently, I was leaving Pilates and I eye-spied a head of cabbage on the curb next to my car. It was like Mother Nature felt bad about my bank account and sported me a freebie. And sure enough, I needed a freebie because Pilates isn’t exactly cheap. Then, on my way home in the middle of the suburbs was a dead chicken. I know, weird, right? Some people call that Road Kill, but I call it a free meal. Sure it had tire marks, which is why I decided to blacken it on the grill to make it all blend in, and won’t you know- my uppity suburban dinner guests, never knew the difference? So raise your can of PBR to a free meal if you should be so lucky to find one in your neck of the woods. But, not your last can of PBR, cause you got to put it up that chickens you-know-what. I found both Road Kill Grill Spice and the beer can chicken contraption at my local KOA general store. 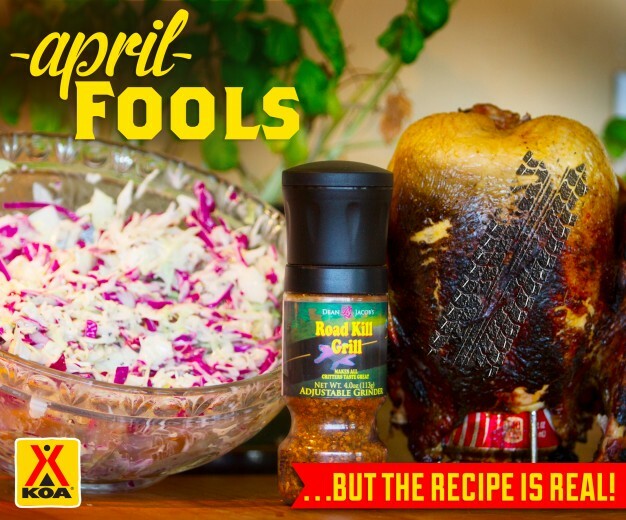 You can use any kind of spice, but I do prefer Road Kill Grill Spice for this recipe. Remove the not so pretty parts of the chicken (head, feet, gizzards, etc.) Remove excess rubber from chicken’s skin and rinse off gravel and asphalt. Smear 2 Tbl. Road Kill Grill spice all over that dead thing. Preheat your grill on low with heat below and on the back burners. Open can of beer and shove it up the chicken’s rear and set over low heat on the grill. Cook for 45-60 minutes or until thermometer reads- No Salmonella /Road Funk Left. Make the slaw while the chicken is cooking on the grill. Slice and chop up the cabbage and cover in dressing. Set aside. After a long hard day of work, Hubs often comes home, tired, sweaty and hoping for a hot meal. It’s often those days I hand him a plate of this kale salad. Sure, I can see the momentary flicker of disappointment in his eyes. Salad can be a very boring meal. I usually follow-up with bourbon on the rocks, or a nice bottle of red, which seems to ease this momentary blow. But, Hubs is a smart man and he doesn’t dare say a negative word. After all he married a vegetarian whose been in recovery now for three years. Every once in a while I like to reminisce about the old days when I didn’t eat or cook meat. At least, that’s my go-to excuse when I haven’t been shopping in a week. Since kale salad is all the rage these days and I get at least two large bundles in my CSA basket each week, we never seem to run out of kale. 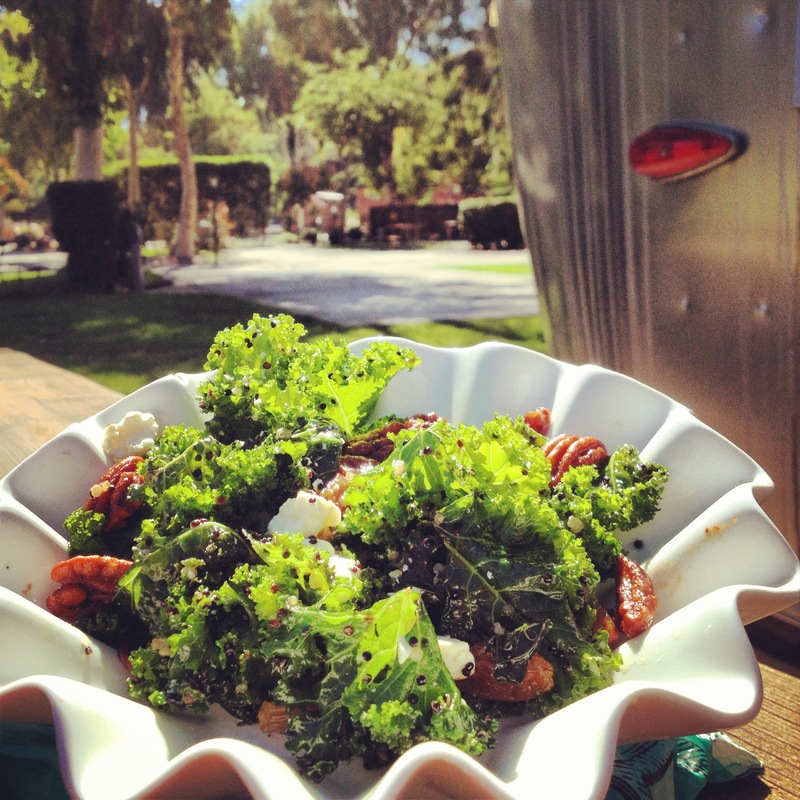 A lot of recipes for kale salad have you dressing the salad and serving it immediately. I suspect this is why some people aren’t very fond of this trendy dark leafy green. While it’s true that it’s a nutritional powerhouse of vitamins and minerals, it also tastes very healthy. One might even say “tough” or “chewy”. I don’t believe kale should be treated like lettuce which has an entirely different texture. My solution to tough kale salad is simple marinate it in a dressing overnight. A salad that tastes better the longer it sits? It seems odd, but it’s true! Won’t it get soggy? Actually, no it will “tenderize” the kale much like a marinade would to chicken or beef. If you don’t have overnight, I suggest a minimum of two hours. I’ve added quinoa which is a complete protein along with feta, raisins and pecans for Hubs sake. Because this salad can easily be done ahead of time, it’s become my new go-to recipe for dinner parties and even camping. This salad can be stored up to 48 hours in advance. That being said, don’t add the quinoa, pecans or feta until you are ready to serve, because those items do get soggy. After washing, stemming and chopping kale, let it dry. In the meantime, combine olive oil, vinegar, honey and juice of one lemon as well as its zest and combine with whisk or fork. Toss in a bowl with chopped kale and leave for a minimum of 2 hours up to one night. I like to do this the night before. When ready to serve, combine with cooked quinoa or other starch substitute, chopped pecans, raisins and feta. Salt and pepper to taste. I come from a family that eats their way through grief. Which is why I decided to make this cake for the 45 kinfolk that came to town for my Aunt’s memorial service last weekend. Every grown man in my family is well over 6 ft. tall, with a hollow leg and a serious sweet tooth. It’s not my usual style of recipe. In fact, it has no ingredients from a Farmer’s Market, which means it will get eaten. I also sat out a veggie platter with ranch and the kin just stared at it, but didn’t dare touch. This is the kind of recipe my mom or Granny would have made for this type of occasion. Mom and Granny would have made it in a punchbowl and I did as well. When I had excess ingredients, I made it in a traditional trifle footed dish, which is far more my style. Instead of traditional cake mix and cool whip, I do impart my own foodie twist. Both were gone in relatively short time. Pineapple is the southern symbol of hospitality. If you can find fresh go for it, but the canned is plenty fine for most my kinfolk and likely yours. This recipe will make the quantities in the footed trifle dish, for the punchbowl double the recipe. Bake the cake in two 8 or 9 inch round pan per box instructions. Cool on a rack and carefully cut one of the rounds in half lengthwise, so that you have 2 thin cakes and 1 thick cake. While the cake is baking, open and drain cans of fruit, set aside. Make pudding according to package directions and keep in fridge. Place 1/3 of the pudding on the bottom of the trifle or punchbowl, make sure there is a nice layer and it covers the bottom completely. Then place a thin layer of cake. 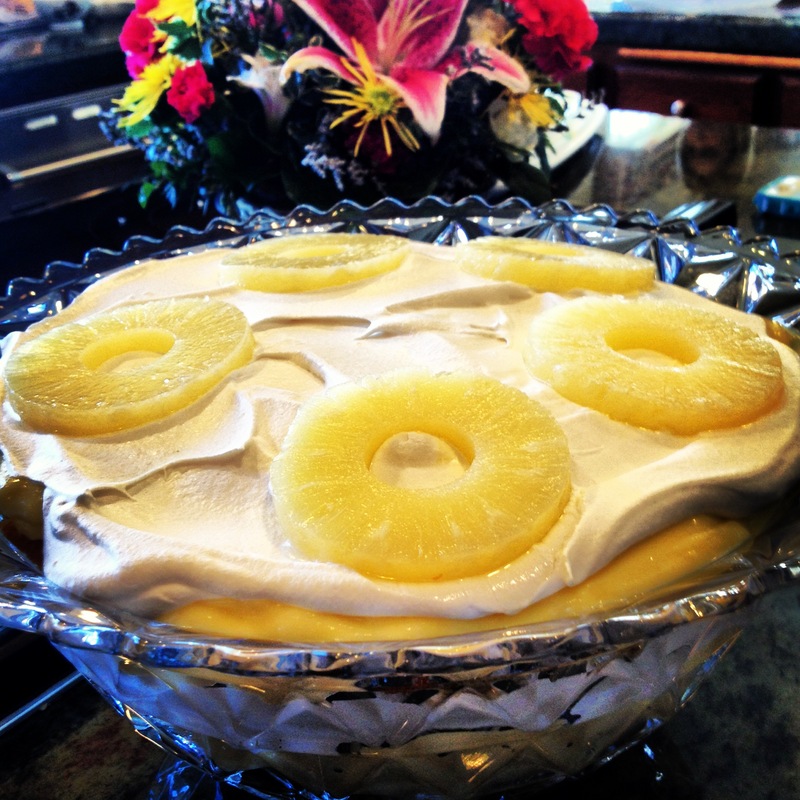 On top of cake spread out a layer of True Whip (about 1/2 the container) and add the entire can of pineapple chunks. Top with the thick layer of cake. Top cake with 1/3 pudding and the drained can of mandarin oranges. 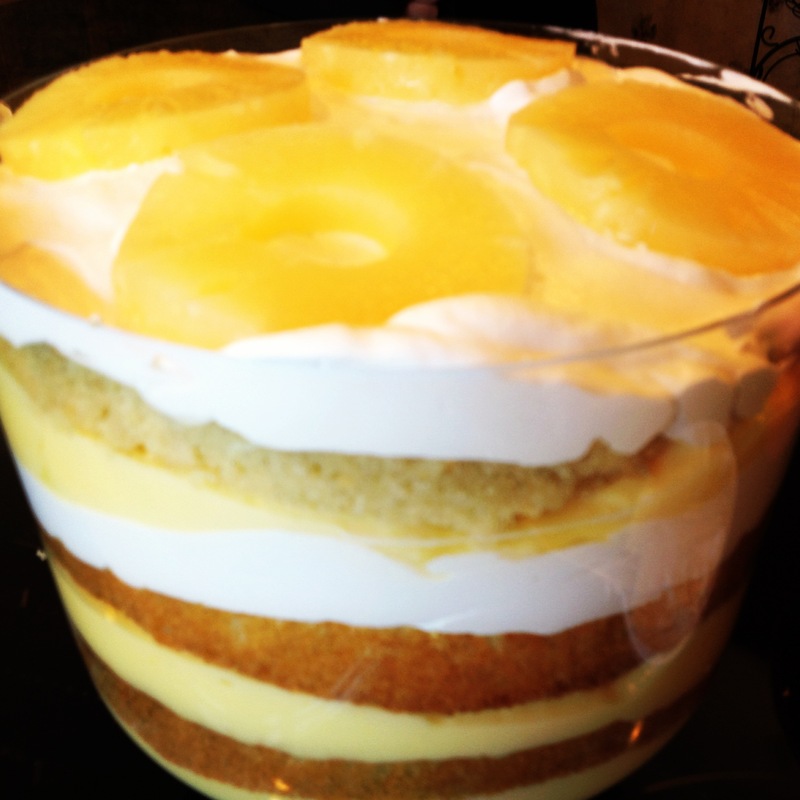 Top with the last thin layer of cake, then add the last of the pudding and top with the remaining True Whip and sliced pineapple. *True Whip is a healthier version of Cool Whip. I can get it in major stores and it’s located next to the Cool Whip in the freezer section. If you cannot find it, you can substitute Cool Whip.